Tin Canlas' verbal defense—she knows how to commute to Alabang—is drowned by the sudden onset of laughter, only to be followed by yet another round. Ate Babes, one of the Barangay Health Workers (BHW) who is with us, quietly enjoys our company. The ride is taking longer than usual. We are to arrive at the Ventanilla Barangay Center in Pasay City at 1:15, and we're late. We are dropped off at a narrow street lined by small houses, home-based bakeries, and sari-sari stores. The place looks more like a typical neighborhood in the City, not as depressing as I thought it would be. "Maglalakad pa tayo nang konti," says Ate Babes. My old friend, Coy Cabanilla, invites me to take a shade in her umbrella, and minutes into the walking, we see half-naked men staring in space, children who have yet to take baths, and women getting manicures. I feel dehydrated. 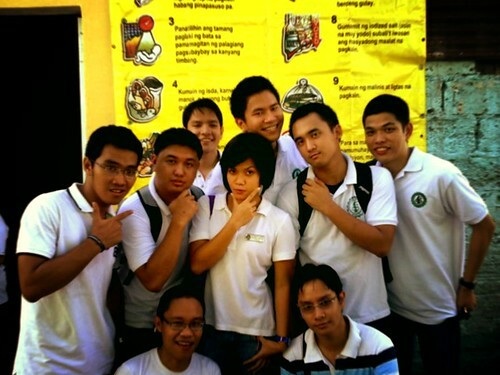 Finally we arrive—all 18 of us, medical students—at the Barangay Health Center. It occupies what used to be an old wooden house. The way inside is narrow. We are led into the makeshift waiting area for patients. And then a doctor with a friendly face greets us. "Welcome to Ventanilla Health Center. Our target area is far from here; we're temporarily occupying the second floor, sharing the building with Barangay San Roque Health Center that occupies the first." She explains that the government has yet to provide for a separate building for the health center. "I don't know if we'll finally have one this year. With every change of administration, you never know what happens." She's a licensed pediatrician, after having finished years of medical training, with the goal of serving her barangay. "I grew up seeing the Health Center, and I thought, 'One day, I'll be working as a doctor there.'" She recounts that most of her classmates are working abroad as doctors, earning huge sums of money. "So what motivated you to stay?" we ask. "It would have been easy for me to go to America. But our country needs doctors. There's a kind of fulfillment one gets when one serves her countrymen." She tells us that the small center accommodates up to 60 patients a day. The consultations are in the morning; the medication for TB patients is in the afternoon. And all year-round the center conducts reproductive health counseling, mother's classes, and information dissemination. "What's the biggest problem you have here?" Without batting an eyelash, she says automatically, "The lack of supplies. Our stacks of medicine are very limited. We can't give everyone the full dose, say, of Amoxicillin because that would deprive the others of medicine, which they also need. But we're surprised that people are actually getting cured despite of this. That was one of the biggest surprises." The place is clearly overworked and undermanned. The supplies are meager, and the City's health budget is limited. "Politicians like to invest in infrastructure, sometimes to the point of forgetting the health sector entirely." But she's joyful and fulfilled, cracking jokes here and there, as if it's the most natural thing in the world. She then introduces the Barangay Captain, a lady in her late thirties, who also works as a BHW. The Kapitana pastes a sheet of manila paper onto the wall and introduces herself, together with the other BHWs, mostly adult women. "Si Ate Babes, 20 years nang nagvovolunteer dito 'yan, at may bagong recruit din kami. Batang-bata pa. Marami pa siyang dapat matutunan." We clap as she recites their names. She proudly documents the trainings they've attended. Apparently the Department of Health organizes a lot of seminars for them; the most recent was on A(H1N1). Kapitana tells us that a BHW works to help out in the health center. "Kami 'yung nagfofollow up sa mga bahay-bahay kung may narinig kaming may nagkasakit. Kami rin 'yung nagtuturo sa kanila ng tamang pagpapasuso, tamang nutrisyon, at tamang family planning. Parang M.D. na rin kami—medyo doktor." And they do it practically for free. In exchange for their services, the Pasay City government gives them a whopping 500-peso honorarium monthly. "And liit-liit po ng suweldo. Bakit pa rin po ninyo piniling maging BHW?" we ask. "Hindi lahat maibibigay ng pera. Napakasarap tumulong sa iba. At biniyayaan ng Panginoon ang sinumang nagsasakripisyo para sa kabutihan ng iba," says an old lady. We learn that they're popular in the community: well-loved, respected, and cherished by the people, so much so that when they run for Kagawad, they always get the highest votes. Isn't it true that good health makes good politics. 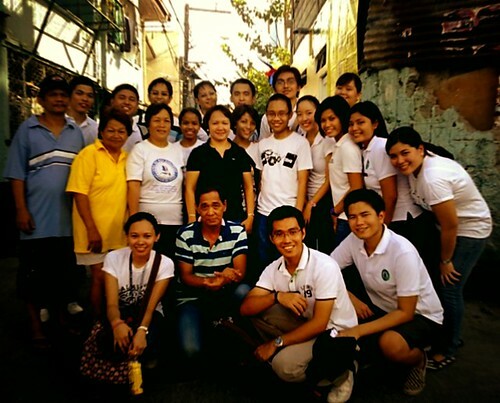 As soon as the talk is through, we find ourselves touring around the barangay. The Kapitana beams with pride as she ushers us to places, pointing a funeral home that has just been erected, indicating Adrian Espiritu's (our classmate whose house is nearby) printing press, and occasionally warning us to take care of our belongings. Exhausted, we stop for a drink. Coke has never tasted this good. The day is almost over, and we're grimy, sticky, and exhausted. Sadly we have another class session to catch to wrap things up. And as we head home, we carry a heavy, burdened feeling of helplessness. But we also realize that if we are to change anything, the change must begin in us. Thanks, Nico. It was disheartening yet encouraging for us. I won't forget the experience.